The Wharton School has partnered with the Office of the Vice Provost for Research to create a unique learning experience for faculty, scientists, and clinicians interested in commercializing their work at Penn and launching a new venture. This program is based on some of the most successful teaching offerings on innovation and entrepreneurship around campus. Read about past workshops here. 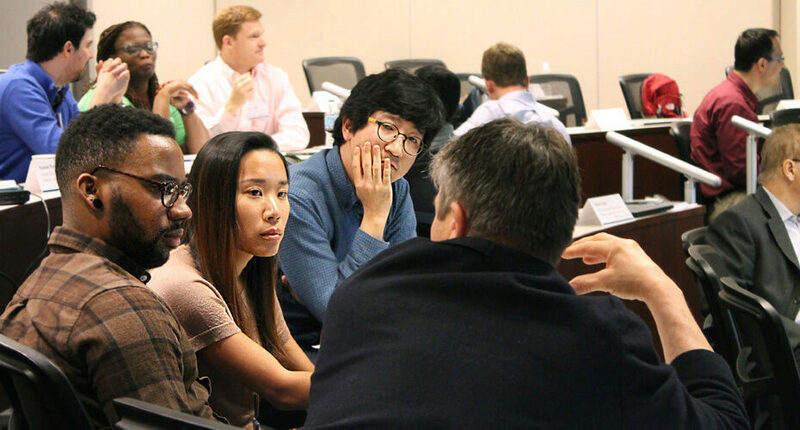 In this three-day program, participants learn techniques to develop their ideas for commercialization and learn the key ingredients for a successful venture. Participants walk through the process of creating a great business opportunity, learn how to evaluate the opportunity, and undertake the first steps of execution. This program is designed for faculty, scientists, clinicians, and post-docs who want to commercialize their research. The 2019 workshop will take place May 2–4. If you have questions about the workshop, please contact us directly. The curriculum consists of a dozen 90-minute sessions that help participants move from an idea to a new venture. Each session addresses a specific piece of the journey. View sample session descriptions here (PDF). Sessions are taught in an interactive format by a team of faculty from Wharton, the School of Design, and the Law School. In addition to the faculty, you will learn from some of Penn’s most successful entrepreneurs sharing their experience of launching ventures while working for the university. Participants who complete the program are recognized as Mack Technology Fellows. View a list of Mack Technology Fellows here (PDF).